“As long as murder is committed collectively, punishment is imposed collectively,” Judge Mohammed Nagy Shehata said in a television interview on February 2, 2015 – the day the Giza Criminal Court issued death sentences against 183 defendants who were charged with killing 11 officers from the Kerdasa police department in Giza in August 2013. Two days following the sentence, on February 4, 2015, the Cairo Criminal Court, presided over by the same judge, issued a mass sentence of life in prison to 299 defendants, including the prominent activist Ahmed Douma, and handed down a ten-year prison sentence to 39 minors in the infamous “cabinet clashes” case. The Egyptian Ministry of Foreign Affairs criticized local and international condemnation of the sentence as “unacceptable interference in the work of the Egyptian judiciary and disrespect for its ruling”. Yet the ministry failed to realize that the widespread criticism has less to do with the sentence itself and more to do with the courts’ obvious disregard for due diligence in line with international standards to which the Egyptian government has committed. These mass sentences are not the first of their kind. In June 2014, an identical number of defendants, 183, received a similar death sentence in the Minya Criminal Court. Among those sentenced was the Muslim Brotherhood Supreme Guide, Mohammed Badie. The same Minya court also sentenced 37 defendants to death and 492 to life in prison in April 2014. The Court of Cassation overturned the death sentence on February 11, 2015. Only 36 of the defendants were successful in their appeal and a retrial has been ordered as a result. 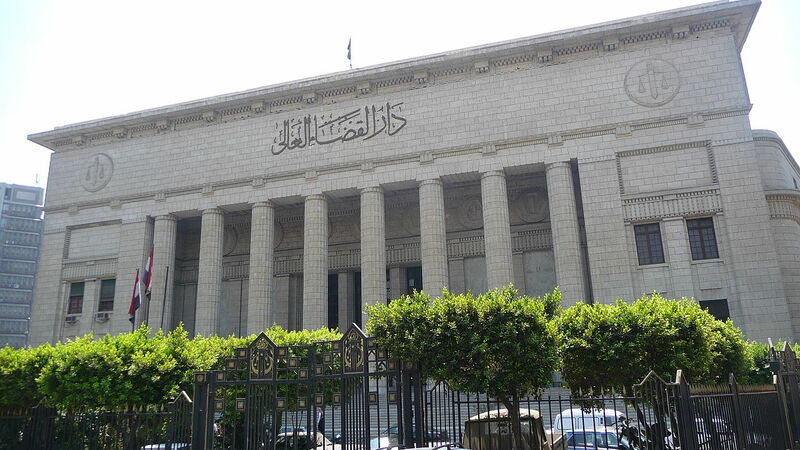 In fact, since January 2011 mass sentencing has become regular practice in the Egyptian judicial system. In March 2011, a month after the Supreme Council of the Armed Forces (SCAF) took over, the “Bal taga” (i.e., Thuggery) law was issued. The law permits punishing all participants in a protest or gathering during which a murder took place, even if participants were not involved. If someone is murdered, everyone can be sentenced to death. In November 2014, the law was formally challenged as unconstitutional for being ambiguous and for violating the principles of just punishment. However, the Constitutional Court has yet to annul or suspend the law, which allows criminal courts to continue to sentence individuals collectively. The Constitutional Court must intervene immediately to appeal or annul this ludicrous law if it is serious about upholding citizens’ right to a fair trial. Egyptians have now gotten used to frequent news stories covering mass death sentences. Although numerous countries and international rights organizations have expressed their deep concern and alarm over the mass death sentences, which are not in line with the right to a fair trail, the Egyptian state continues to permit the practice, assuming that stability will follow. However, they are consistently proven to be wrong – anti-government protests, which often turn violent, have not ceased. Both police and civilians suffer – police officers continue to kill dozens of civilians while many officers die as a result of violence committed by civilians. No matter how serious the charges, every defendant has the right to a fair trial. Penalties and trials should serve the purpose of implementing justice, not seeking revenge. International human rights charters emphasize defendants’ right to a fair trial and set principles upon which punishment should be based. They also grant every suspect the right to a defense and the assumption of innocence until proven guilty. Human rights laws also grant suspects the right to legal counsel. Defendants, under human rights laws, have the right to examine and respond to evidence, obtain and cross-examine witnesses’ testimonies, and subpoena their own witnesses, among other rights. Mass trials violate these principles, and an unfair trial inherently means an unfair punishment. Justice cannot be assured unless every suspect is tried individually and provided with a proper defense. The mass sentencing in Minya reveals how absurd mass trials are. Among the 183 defendants in Minya charged with belonging to the Muslim Brotherhood and sentenced to death for raiding the local police department and killing a police officer were a blind man and a Christian. A child was also among the defendants, despite the fact that Egyptian law clearly prohibits sentencing a child to death. It was only thanks to a child rights organization that the death sentence was successfully appealed. In fact, in a different mass sentencing in Minya, another child was sentenced to death. These examples show that in mass sentencing, the court fails to take into consideration factors like the age of the defendant, the circumstances of arrest, or health conditions, let alone examine the evidence. Egyptians have nicknamed Shehata the “death penalty judge.” His response, when asked about the nickname in the same interview, was: “I was named after the late Judge Adel Gomma’a, who was known for his firmness.” Shehata made references to religion when he said: “I am satisfied and content with the verdict, because there is another court in heaven that is watching.” This was not the first time he had referred to the connection between his verdicts and God’s will. In the same interview with Al-Watan newspaper, Shehata said: “the judiciary is God’s shadow on earth. We act on his behalf to establish a just state.” We do not know how many other judges in Egypt also perceive themselves as arbiters of God’s will. Shehata also referred attorney Khalid Ali, a former presidential candidate, and a group of attorneys to the disciplinary court for insisting on examining Ahmed Douma’s case file, something that ought to be standard legal procedure. Following this incident, Egypt’s lawyer syndicates issued a law in November 2014 banning lawyers from presenting in front of Shehata due to his constant violations of the constitution, the law, and the right to defense. Nevertheless, Shehata continued to preside over the case, disregarding defendants’ rights to a proper defense and eventually handing Douma and 229 other defendants their life sentence. The Egyptian state claims it is serious about establishing a modern, democratic state. As such, it must recognize that its judges, who serve the state, must apply the rule of law, which is fundamental to any state. To avoid the further collapse of the Egyptian judiciary, the Egyptian state must immediately put an end to the policies of mass sentences and modify trial laws and procedures so as to guarantee the standards of fair trials and most importantly, the right to defense. The state must also guarantee attorneys the ability to perform their duties freely and annul unconstitutional laws, specifically the “Baltaga” and protest laws, which are being misused by the police and courts alike.